The drug enforcement administration determined some years ago that heroin and prescription drug overdoses have overtaken auto accidents and firearms as the leading cause of deaths due to injury. Overdose deaths in the United States rose to 72,000 in 2017 from 66,000 in 2016. Since 1996, 200,000 people have died of prescription drug overdoses. 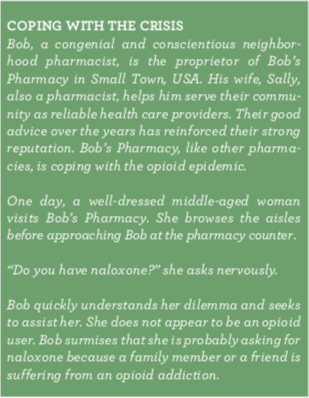 The opioid antagonist naloxone stands on the front lines of the battle against the opioid epidemic. Emergency medical technicians and hospital personnel have long relied on naloxone to treat opioid overdoses. Now it is available to drug users and their family members. Real-life Surgeon General Jerome Adams, MD, MPH, who also has a family member who suffers from opioid use disorder, is vigorously addressing this epidemic. His plan consists of normalizing the use of naloxone, teaching Americans that substance abuse is a disease that merits compassion, and preventing opioid use. “It allows us to get them into a more definitive and long-term treatment,” he said. On October 3, 2018, the US Senate overwhelmingly passed the SUPPORT (Substance Use-Disorder Prevention That Promotes Opioid Recovery and Treatment) for Patients and Communities Act after it was passed by the House of Representatives on September 28, 2018.2,3 President Donald J. Trump signed the bill into law on October 24, 2018. This legislation is intended to fight the opioid epidemic through research, treatment, and aid to families affected by it. The provisions include, among others, ones on clinical guidelines, continuing education, non-narcotic alternatives, prescribing limits, and prescription drug monitoring programs. 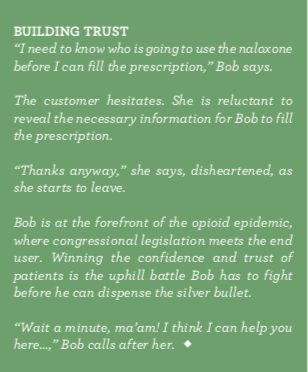 Collaborative practice agreements, which allow pharmacists to prescribe naloxone to at-risk individuals. The collaborative practice agreement may be conducted with either individual physicians or on a statewide basis. Good Samaritan laws, which offer protection to individuals responding at the scene of an overdose from being arrested for possession of a controlled substance. Liability protection/third-party administration, which protects the prescriber as well as the person who administers the naloxone. It also allows naloxone prescriptions to be given to bystanders for use on victims of opioid overdose. Naloxone is often sold under the brand name Narcan. It is thought to be a silver bullet in the opioid crisis, in which more than 2 million Americans have become addicted. Someone in the United States dies of an opioid overdose every 20 minutes. Naloxone reverses the effects of an overdose by inhibiting opioids from affecting parts of the brain receptive to opioids for 30 to 90 minutes. It keeps the autonomous body functions working and thus prevents respiratory depression that typically leads to death from an overdose. Naloxone for take-home use is available as an injectable and as a nasal spray. Both formulations rapidly reverse the effects of an opioid overdose. The nasal spray tends to be favored by caregivers and patients, but the injectable kit is more widely available in pharmacies. An auto-injector is now available and is easy to dispense, but it is more expensive than the other formulations. Federal funding has increased over the past few years to fight the opioid epidemic. Congress is also addressing the epidemic by dispensing opioids in limited amounts for 3- to-7-day periods, funding research for nonaddictive pain medication, and increasing the ability of pharmacists to track opioid prescriptions (and to prevent diversion). In addition, in March 2018, $4.7 billion was ear-marked for the effort, including $1 billion in grants to states. The number of deaths due to overdoses declined slightly in December 2017 and January 2018, which suggests that concerted efforts to prevent opioid use are starting to take effect. Surgeon General Jerome Adams outlines his plan to halt the opioid epidemic. Mediaplanet website. futureofpersonalhealth.com/ prevention-and-treatment/surgeon-general-jerome-adams-outlines- his-plan-to-halt-the-opioid-epidemic. Accessed January 31, 2019. Itkowitz C. Senate easily passes sweeping opioids legislation, sending to President Trump. Washington Post. October 3, 2018. washingtonpost.com/politics/2018/10/03/senate-is-poised-send-sweeping-opioids-legislation-president-trump/?utm_term=.21ef8d57fa1f. Accessed January 30, 2019. Andrews N. Senate passes bipartisan legislation to combat opioid epidemic. Wall Street Journal. September 17, 2018. wsj.com/articles/senate-passes-bipartisan-legislation-to-combat-opioid-epidemic-1537225510. Accessed January 31, 2019. Ned Milenkovich, PharmD, JD, is chairman of the health care law practice at Much Shelist PC in Chicago and former vice chairman of the Illinois State Board of Pharmacy.